Salt water swimming pools are the pools that use salt in the water in order to generate chlorine. These pools come with a chlorine generator, which through the process that involves water passing through electronic cells produces liquid chlorine (also known as sodium-hypochorite). So, a salt water pool isn’t a chlorine-free pool, but the one that makes its own chlorine. Here’s what you should know about this type of pools if you are considering having one built on your property. The chlorine generator system has two parts, the control unit and the salt cell, the former of which is used to regulate the power supply to the latter. When the power is supplied to the salt cell, chlorine is produced. The amount of power that goes to the cell is usually regulated by the control knob on the unit. With the pump on,salty water will flow through the cell and the process of electrolysis will convert the salt in the water into liquid chlorine. These systems produce a certain quantity of chlorine per hour. What you need to do is consult with your pool professionals in order to choose the system that can produce sufficient chlorine for the volume of water in your pool. As manufacturer specifications usually indicate the number of liters of pool water for each system, you should buy a larger system if your pool volume is between two models. 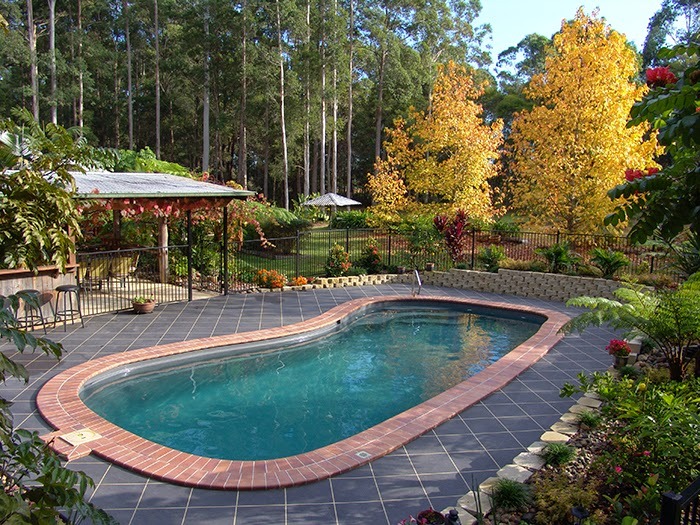 Salt water swimming pool systems come with a number of benefits. Continuous sanitation of these pools will eliminate free chlorine volatility, noxious chlorine smells, as well as the need to transport, store or handle chlorine. The average person can’t taste the salt in these pools since the salinity is mild, pretty close to that of human skin, so the water will feel smooth, and so will your skin after leaving the pool.This handy online tool can help you attain the desired salinity for your pool. The majority of pool owners buy salt water systems in order to improve water quality, comfort, as well as other previously mentioned benefits. But you can also save plenty of money if you no longer need to purchase chlorine for your pool. After the initial cost, it commonly takes 2-3 years for this system to pay for itself. Salt in these pools is lost only when a certain amount of water leaves the pool through splash-out, backwashing orleaks, so you’ll need to replace around 10% of salt each season. Monitoring and keeping the salt concentration between 3000-4000ppm (parts per million) will provide the adequate quantity of salt for the cell to produce the liquid chlorine required to maintain your pool. You can go to a pull supply store and buy salt test strips and kits to help you with this. As the chlorine generator only makes chlorine with the pump running, you’ll need to set the pump in motion whenever your salt water pool needs additional chlorine. When it comes to the salt cell, the majority of these units now come with a built-in self-cleaning feature, which reverses the polarity of the voltage in the cell in order to remove scale buildup from the cell plates. If your unit doesn’t have this feature, however, when the swimming season comes to a close, you can use a mild muriatic solution (1 part muriatic acidto 10 parts water) to clean the cell. Author Bio: Lillian Connors is a blogger and home improvement enthusiast ever so keen on doing various DIY projects around her house and passionately writing about them. She is also an online marketing consultant, closely collaborating with a number of companies from all over the globe. You can check her out on G+, Facebook and Twitter. How the Glass Splash Backs are Advantageous?